Without being discourteous to Dean Owens, the first thought to cross the mind when discovering the Buffalo Blood project was the Orphan Brigade with a little bit of Celtic exchange. Similarities run abound from location-based and theme-driven to creating a cinematic soundscape. There is also the unison of usual suspects in Neilson Hubbard and Joshua Britt, with another cameo from Audrey Spillman. However, the switch between the Northern Irish brogue of Ben Glover to the softer Edinburgh tones of Dean Owens is a significant directional adjustment, not just that the Scotsman probably has the slightly higher profile role across the record than the other three involved. 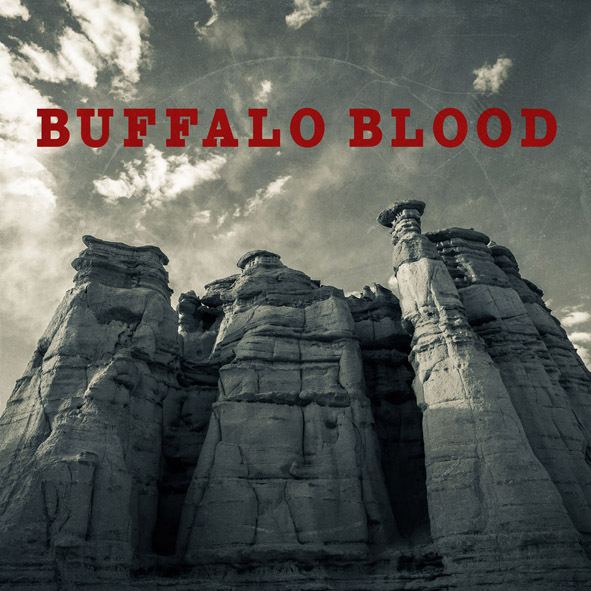 Whereas the Orphan Brigade went on location to Kentucky, Italy and soon-to-be Ireland, Buffalo Blood travel deep into the wide-open expanses of New Mexico, with a particular focus on the indigenous people who bring a distinct flavour to the area. Across fifteen tracks that form the content of this self-titled album, the project sweeps through a land of mystique, intrigue and affliction. Creativity runs deep in the production (steered by the widely acclaimed Neilson Hubbard) with repetition used in tempo, whistling and chant-inspired segments. Amidst the little intricacies lie a number of conventional songs frequently driven by mandolin that provide a commercial edge to the album. While being a fan of Owens, Hubbard and Britt in their previous roles acts as an advantage, there is still a fair amount of work required to grasp the complexity of this record. There is likely to be a bulk of information published about this project relating to the inspiration, meaning and artist interpretation, so maybe a little listener introduction can find a spot. Buffalo Blood is the debut release from Eel Pie Records and noticeably will only be available on double vinyl and digitally. An interesting signal to the future of the CD. While the physical format has certain predetermined markers, there are also indicators when listening to the fifty-three minutes via the other medium. Chunking the tracks into equal thirds proved a handy method. There were dedicated markers in Hubbard’s tender offering ‘Daughter of the Sun’ at position five and a vocal-free instrumental piece titled ‘Ghost of Wild Horses’ , complete with further whistling, settling neatly at number ten. The latter providing a suitable resting place before the album finale kicks in. Dean Owens is the most familiar of the vocal offering, apart from the gorgeous ‘White River’ beautifully sung by Audrey Spillman. Her only other major input was sharing verses with the others on ‘I’m Alive’, one of five Owens solo writes and probably the standout song from the opening third. The song writing overall takes on an egalitarian role with all three main players submitting solo writes alongside numbers credited to Owens/Britt, Owen/Hubbard and Hubbard/Spillman. The latter brought us the aforementioned Spillman number (a real husband-wife effort), which probably shares top mantle in the middle third with title track ‘Buffalo Blood’, a more upbeat piece that would flourish in the role of album focal point. The final third presents more of the same including whistling, chants and further deeply excavated songs that require several listens to grasp fully. Maybe, album closer ‘Vanishing World’ possesses the most explicit message. It is awash with poignancy and interpreted points like can we co-exist. Underpinning the whole record is the location and the inspiration of the people, land, sky and life. While the album is not overtly long, its playing time is packed full to the hilt that you feel it is much longer (not meant to be a slight). There is an epic feel to the record and exploring it is akin to diving into a new Tom Russell record. Although you would not expect anything less when musicians/artists/songwriters like this collaborate. The intended audience for this album is always going to be niche though one with a finely tuned ear. The sheer quality injected into the process that shines through in the finished product is a selling point on its own. Chasing popular appeal is not on the agenda, but who says that popular appeal should not chase what is good! The genre-less status of Buffalo Blood makes it ripe for Americana love, and dependent to which angle you look at it, the UK and US operations may come running. Indulgent or masterpiece, take your pick, though why not be a bit of both.